and benefit from the prestige of one of the few remaining Irish Pipe Bands in the country, with a history spanning 65 years and a tradition of service to the community throughout the North West. 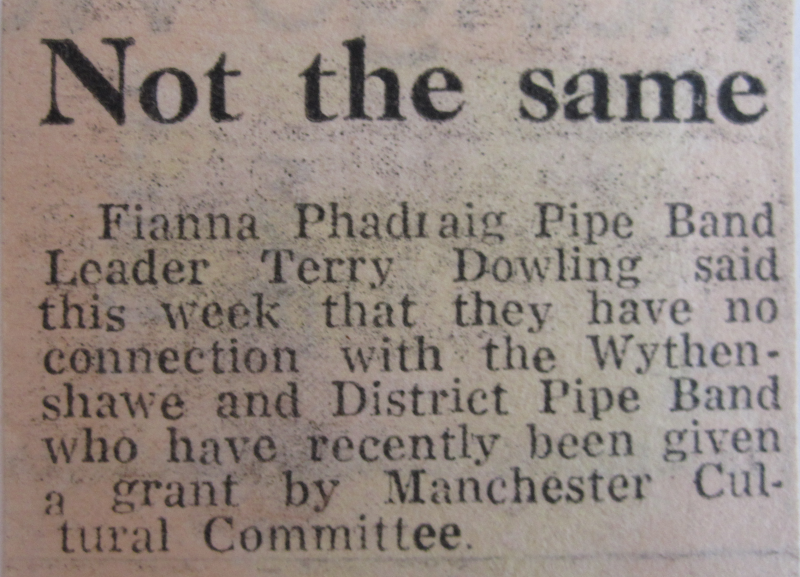 Throughout its 65+ year history, the Fianna Phadraig Pipe Band has become a much loved institution within the Irish community of Wythenshawe, Manchester and the North West. The Band has raised thousands of pounds over the years for worthy causes and people in need and does not hesitate to provide its services free of charge for the charities it has supported for decades. The Band is a strictly not-for-profit organisation and none of its members receive any payment for their time or their performances. Not surprisingly, as with any not-for-profit organisation, funding is a constant concern. Uniforms cost in the region of £500 each and an instrument costs between £500 and £800. At current membership levels, we need to replace 4 uniforms each year and at least 2 instruments. Performance fees cover part of these costs, but needless to say, they are not enough to meet all the Band's needs. This is where our sponsors' help is invaluable. Our sponsors currently provide funding of £500 each per annum, thus generously covering the cost of one full uniform each. In return, we offer them visibility on our website, with a sliding banner on each page, together with a short text introducing their business and a link to their website. In addition, whenever we organise a reunion dance, we offer a half-page advertisement for each sponsor in the brochure handed out to all those attending the dance. So if your company would like to help the Band fund its activities for the next year and beyond, while gaining visibility throughout our community of supporters, please get in touch via our contact form. Remember to leave a contact name and phone number. We'll get back to you straight away!